Hello. I am trying to track down an apparent common problem in my wife's US-based '97 C280: the center vent doesn't always flow air, and has a lot to do with throttle position / RPM. From what I can tell, it's vacuum related, but I need to know where all the lines go to, such as a distribution block in the firewall, etc. If you have a vacuum diagram available, please let me know! I am having the exact same problem in my 1997 c230, and it has to do with throttle and speed also, i hope we can figure this out, its driving me nuts. It seems to be a common malady. But first, check to make sure the thin plastic vacuum line (often white), that runs across the top of the firewall and drops down near the oil filter, hasn't been pulled off where it attaches up and under the intake manifold (about 6" forward of the oil filter). It's a common thing that happens sometimes during oil changes. I found that in my case. Now I also suspect a leaking vacuum line. Apparently some cars have a vacuum distribution manifold of some sort (perhaps in the RF wheel well) but before I just start tearing into things, I wanted to see a diagram of the entire vacuum system. Something similar to this from another MBZ forum: http://www.mercedesforum.com/upfiles...BF6675606E.jpg, but with info beyond just the door locks. Last edited by RProsser; 01-05-2008 at 12:02 PM. Find the right section for your model and then start looking around. It is a great resource. Bookmark it. It is an awesome tutorial for removing the dash to fix the vacuum lines. Unfortunately, when I go to the first link you posted, after choosing the correct car "202.028 C 280," I am taken to a blank page. Can you please double check to see if it works for you? If so, I have studied it, but unfortunately that car is not US spec, and so it shows the vacuum manifold in a different place. It's close though, and that's why I am looking for a vacuum diagram. Last edited by RProsser; 01-05-2008 at 02:04 PM. FWIW, I went to that same section and it worked fine for me. That site is up and down all the time. You often have to come back later. It is a great resource for free though. Yes, that is the same tutorial. It does download slow. Really? I am surprised that all left-hand drive (like U.S. as well as in the picture) are not the same. Maybe there is a difference between pre-facelift (pre 97) and later cars? That would be an expensive modification. Also, for generic stuff like the heating system, try other w202 models listed. Sometimes they will work when others will not. Yes, I know, it is odd. Thanks for checking for me. I normally use FireFox which will not show the content on that page, so I tried it with IE7, and it worked! No time to figure out why. 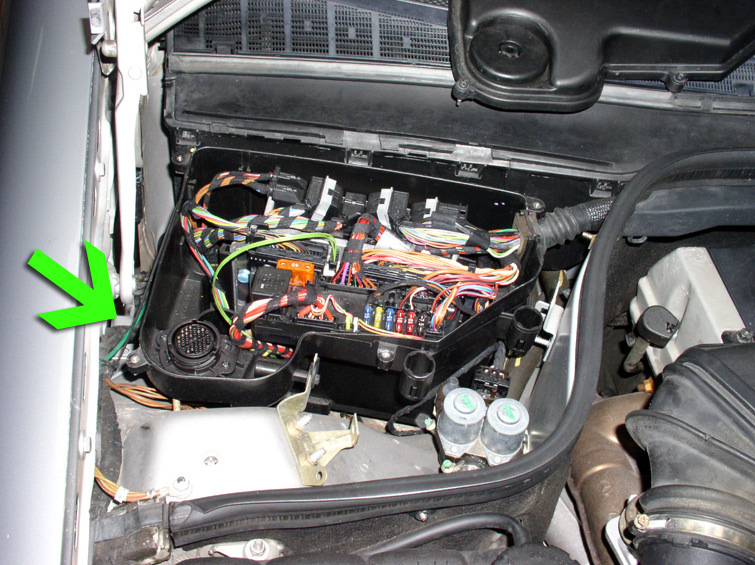 Anyway, yes, the US spec car has a lot more electronics in that area when compared to the car found at http://www.zadefaraj.com/dashboard.htm. As example, note the two photos attached. The first is that non-US spec car from the above link, and the second is my silver US-spec car. 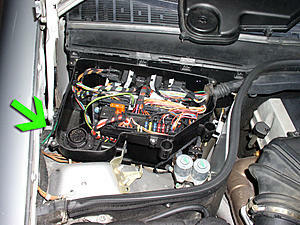 Note the same green vacuum line, but there are a lot more electronics in that box with my car. I want to check the vacuum diagram that *may* be buried under all those wires, but I'd like to be sure it's worth the time to pull all that out. For all I know, the vacuum diaphragm is in another place. And with that in mind, I am concerned that the above mentioned Romanian diagrams show the same non-US spec car. But it's better than nothing! Last edited by RProsser; 01-05-2008 at 02:54 PM. Ok, I was just wondering if that was what would be revealed if you removed the black box full of electronics. I noticed Z's car was a 95 and your car is a 97. Wasn't mid-year when the facelift ocurred? Maybe that explains the different/upgraded arrangement? Oh, ok, I didn't know he was outside of the U.S. He does talk about Autozone in his writeup, so that is why I had assumed he was in the U.S.
Perhaps you're right. Maybe he is in the US, but I thought someone on another forum thread stated he wasn't, but obviously I could be wrong. I just pulled the RF wheel well liner out, and inspected the vacuum canister that is tucked away in there. It has two tubes going to it: one green, one white, and all seems intact. And I don't think there is anything much to speak of under the electronics bin in the engine bay because I see one white vacuum line that goes under it, and it slides freely back and forth from both sides as though it just passes underneath. Where is this notorious vacuum dist block? I may check the foot well next. Did anyone find a solution to this problem yet? FYI, I spent last weekend reading/researching on line, pulling off panels, inspecting vacuum connections, listening to things turning on/off (or opening/closing), etc., and still nothing out of the ordinary. As far as I can tell, everything is intact, working, and flowing EXCEPT the center vent which flows air (warm or cold) for less than a minute when the car is first started. After that, and when the system is set to AUTO, occasionally it starts to flow air from the center, which is usually accompanied by a change in fan speed. Then it's stops again. One thing I didn't try is pulling off the LCD control panel to clean the plug connections, but now I'm grasping at straws. Note, there is one other symptom which may or may not be related to the same vacuum problem up front: When I press the interior cabin release for the trunk, the pump starts in the RR quarter panel, the trunk pops open -- as it should. However, the pump keeps running for 10 seconds. Now UNTIL the pump stops running, allowing the lock to release with a "pffft," I can't close the trunk. I think I used to be able to slam it down immediately. Could this be a clue? I hate to admit defeat, but I'm starting to feel like I have to live with it -- unless that is, some MBZ tech here takes pity on us and helps us get to the bottom of it. From my research I can say that this center vent issue looks to be a common problem with the W202 chassis C-class. No doubt a lot of owners on this forum would like to have the answer. Last edited by RProsser; 01-11-2008 at 01:53 PM. 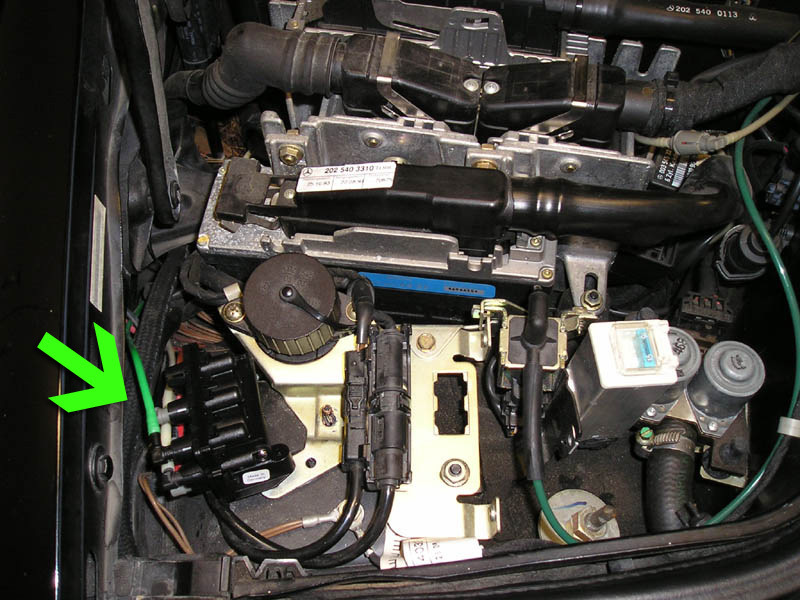 If you hear the vacuum pump constantly working when the car is on, you most likely have a vacuum leak somewhere. Also, the vacuum pump tends to turn off about 5-10 minutes after the car has been on if it has a leak, otherwise it should cease within 5 seconds. I would check the the vacuum control unit, located behind the glovebox (in my 95 c280) and get a vacuum test kit to check each line. Read "Moving of the Vacuum Control Unit for the vent system in the cabin in order to be removed:" to see the location. Also, slightly lower is the test kit to check the vacuum lines. FYI, last time I checked, the vacuum pump is not constantly running. As mentioned in my last post, I heard it working for about 10 seconds when the trunk latch was pressed. Yes, that link is posted a few times already on this thread. I have read it carefully before, and thank you for your effort creating it. Now I just need to find the time to yank that vacuum unit out, and start testing it. Last edited by RProsser; 01-19-2008 at 02:01 PM. Thanks for the interest, but been there done that (note my mention of the hose in post #3, third paragraph). You are right though ... it's the first thing one should check. I found mine was off last year (thanks to some knuckle-dragger at Jiffy Lube). When put back on (after inspecting the rubber end for splits, etc.) the symptoms lessened, but unfortunately it did not completely remedy the problem. Last edited by RProsser; 02-05-2008 at 11:13 AM. I see. then it could be your vac pump or your heater blower is acting up. the vac pump will need a mechanic but you should be able to take out th eblower motor yourself since it's under the dash. It's not the blower. The fan blows plenty hard. The problem is not consistently getting air out of the center vent, and only the center vent. The "vac pump," meaning the device buried in the right rear quarter panel? Yeah, maybe. Thing is, it's not always running, and every other vacuum-based device in the car operates. From everything I have read, and been told here, I'm figuring it's the vacuum distributor buried behind/under the glove box. At least I HOPE so. I sure as heck don't want to break-down the dash to get to the center vent servo actuators! Hello. I am having the same problem with my 95 C280. I looked at the vacuum line under the hood and discovered that the gray plastic connector was broken and when I attempted to remove it, it came apart. I can't find a replacement because I don't know the proper name for it. Does anyone know the name of this piece? It was attached to the green vacuum line. I order an adapter; however, it came with the large port end attached and the end that would fit into the line was too big. Here is how I fixed CENTER VENT AIR FLOW, EASY to do. Remove the glove box, 2 screws at the top edge next to the latch. 2 on the bottom, sometimes they are cover with a plug, they are right where the felt part of the glove box starts and about 1 1/2" from the left and right edge of the box. !!! UNPLUG THE GLOVE BOX LIGHT BEFORE YOU PULL IT TO FAR !!! Oh, yes, don't forget to plug it back in when done, like I didn't do. You should be able to see the top of the Switchover Valve Block (SVB), at the top there is a Green line. Right in front of it is a black tube connecting the right vent and the center vent air (so air can flow to the right side vent). Push it to the left hard and remove it from the right vent connector. Now you should be able to see the whole SVB. On the #2 hose (Marron or Dark Red- solid color) you want to clamp that line off. I used a bent washer, fold the washer, place the line in the fold and clamp it shut with a pair of Vise-Grips. I used two, just to make sure. NOW THE AIR CONTINUES TO BLOW OUT THE CENTER VENT. This may effect your defroster, I used the switch to change air flow and I am getting some air to the Defrost vent when I have it in the ARROW UP position. Use the AUTO air and you will have air flow regardless of pressing on the accelerator. ANYWAY, it is EASY to remove the glove box (only 4 screws) and I can remove the clamp when winter comes...We don't have much winter here in Phoenix, Arizona. You you would like to test this concept first, just put a pair of Vise-Grips on the Maroon (clamp it closed) and give it a test drive. Then you can work on clamping it off with the washer method I used or whatever you can think of. Last edited by gfinnell; 07-05-2011 at 08:14 PM. Reason: adding more information. Thanks gfinnell for sharing the instructions fixing the center vent issue. I went to the dealership and purchased the "vacuum adapter plug". It didn't hurt my purse too bad. I might go back for another part. I'm trying everything I know to get some air here in "HOT" Mississippi. I'm sure I will be the best lady mechanic in the city when I finally get my AC to work. I replaced the accumulator, replaced all the broken vacuum plugs, found a loose vacuum line and plugged it back up, tried the codes, everything. I'm getting air from all the vents now. Only problem is, its all "HOT" air. Like the heater, even though the EC light is not activated. I put the unit on AC, 4, inside circulation, still nothing but hot air. Spent money on can after can of R134. Now, I'm going to replace the compressor this week and see what results that will give me. I got so frustrated one time I thought I would sell the car. But Nah... I'll get keep trying to find a fix. It's paid for, at least I won't have to try and fix it while I'm still trying to pay for it. does anybody have a diagram for the 2000 c280. ...air is blowing out of defrost only. I ATTACHED IT TO THIS MESSAGE. DID YOU READ MY POST ABOUT HOW TO TERMINATE THE VAC LINE TO THE BLOCK BEHIND THE GLOVE BOX, THAT WILL GIVE YOU AIR VIA THE CENTER VENT, MINE IS WORKING JUST FINE NOW. is it on this post? or another one? in it I tell you how to shut off one of the vacuum lines to get air to that center vent. I was having the same problem, air would stop flowing to center vent when you accelerate the car. let me know if you have an questions.